The truck you will need depend on the size of your home and the amount of household goods and furnishings you have. Rental trucks come in limited sizes. Here are some general size estimates based on the number of bedrooms in a typical home. The size you will need may vary if you have a garage or storage unit. 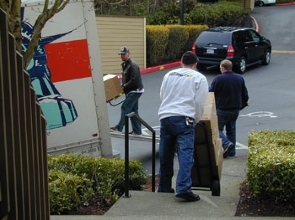 Our Nice Guys come equiped with necessary tools to carry out your Seattle move in the most efficient manner possible. We provide dollies, furniture straps, rope, and any hand tools necessary to assemble or disassemble furniture. Hand trucks may not always be useful with several stairs or uneven terrain. It is always best to have as much as you can in sealed boxes and ready to go prior to our arrival. This allows us to work at top speed and cuts down on general foot traffic through the house. Items that don't quite fit in a box generally can get into one that's not sealed. These are OK as long as they are kept to a minimum. 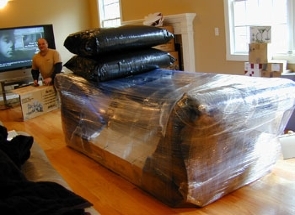 There are several factors that determine the total time required to complete your move. Here are a few: How many boxes, how much furniture, how many odds and ends, how many flights of stairs, size of elevator, long hallways/long carry out to the truck, and how many items need to be disassembled and reassembled. Fill out our estimate form for a custom estimate or see our "General Estimates" section. Kids and pets are best kept under extreme supervision on moving day. Both are unpredictable and may jump on us or crawl next to our feet when we are working. This is not only a hazard to your kids and pets, but to my guys as well. If animals are safe in a bedroom or bathroom, and children are attended to, we'll have a safe working environment. Lets all work together to make this moving experience accident free. 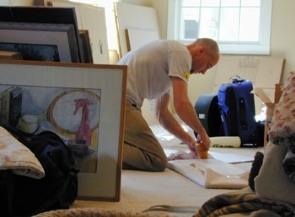 It is always best to schedule contractors, cable guys, or house cleaners on a separate day from the move. These create additional traffic and general obstacles making our job more time consuming and dangerous. Yes, we provide standard utility dollies, rope, furniture straps, and any tools we might need if something needs to be dismantled or reassembled. All we need from you is the truck and any pads that are necessary. If there are specialty items such as refrigerators or safes, you may need to provide additional equipment. How Much Do Seattle Rental Trucks Cost? Rental trucks generally have a flat per day rate plus a mileage charge, fuel and insurance if you want. Average rates are between $20-50 flat plus $.50-1.50 per mile. Out-of-state or one-way moves are charged differently. Rentals for these moves are charged one flat rate and given a set # of days for the trip. Rates for one-way moves vary depending on the distance you are traveling and the demand for rentals in your destination city. All truck rental facilities have furniture pads available to rent along with the truck. It is best to order these in advance when placing your order for the truck. We will provide you with a good estimate on the number of pads you need during the booking process. Will Your Guys Drive The Truck, Or Do I Have To? Unless you have ordered the driving service, you or someone you designate would need to drive the truck. Driving service is $50 flat + $1.50 per mile, in addition to the standard hourly rates. The driving service must be scheduled in advance of the move as only certain crew members are authorized to drive trucks. No, There are no additional fees or hidden charges, just the hourly rate and the travel fee. Yes, Nice Moves is a fully licensed and insured company. Standard coverage is $.60 per pound if anything is damaged. For example, if a dresser gets scratched and the dresser weighs 200lbs., the insurance payout will be $120. We are not liable for any items damaged inside boxes that are Packed-By-Owner(PBO). Piano's fall under the “Specialty Items” category along with pool tables, large gun safes, Xerox machines, Hot tubs, etc… These Items require specialty movers in most cases. Depending on the location, we are capable of moving these items. Typical start time for most locations is 9am, some that are closer to the office or make prior arrangements can start as early as 8am. The latest start time we have is 6pm. This start time only allows for a request of the 2 hour minimum as we have an 8pm cut-off time.